Aldi has come a long way from the old days of being the “stock up store” — a slogan the grocer used decades ago. We’ve come to really like Aldi’s “premium” lineup of foods, whether it’s in the form of steak, shrimp, or crab. You can do a quality dinner with Aldi food, especially when Aldi rotates in specific items as part of its rotating ALDI Find (Special Buy) lineup. Aldi’s Valentine’s Day ads bring with them a number of fun food items (and non-food items) that can help you create that perfect Valentine’s Day experience. The past few years, one of the rotating late January / early February offerings has been, not just lobster tails, but a whole lobster. We couldn’t resist trying this out. Fremont Fish Market Whole and Raw Maine Lobster is an ALDI Find (Special Buy), which means that it’s only stocked once: when your store runs out, you’ll have to wait, probably until next year. It runs a cheap $9.99 and comes in a pouch, not unlike Aldi’s crab legs. Fremont Fish Market is an Aldi house brand, having been introduced just last year, and appears to be a successor to the Sea Queen label. 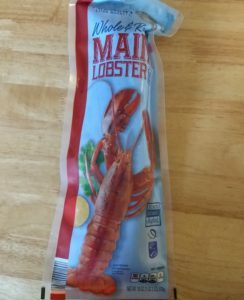 The lobster comes in a frozen pouch, which means it’s not fresh lobster … although there is research to suggest that there isn’t much, if any, taste difference between frozen and fresh lobster. 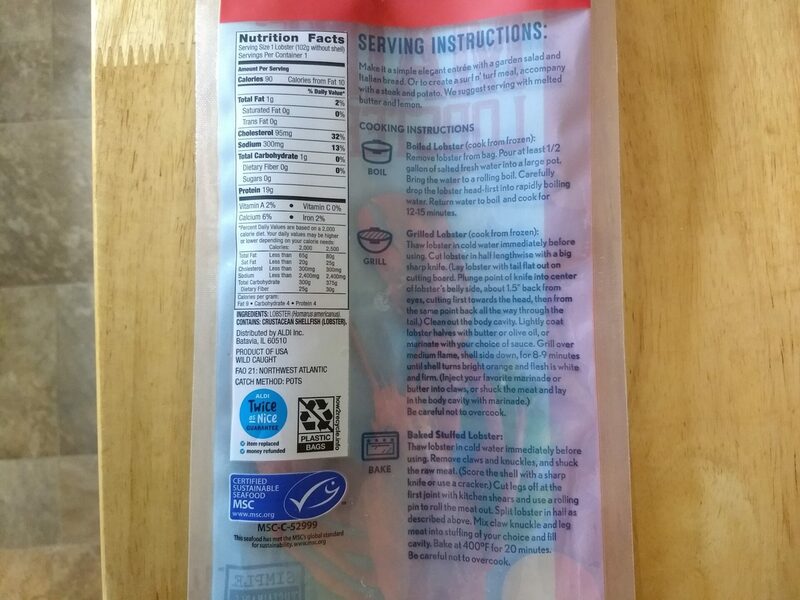 The packaging includes a notice from the Marine Stewardship Council that it is both “wild caught” and “certified sustainable seafood,” noting that it was caught by a pot in FAO 21 of the Northwest Atlantic. 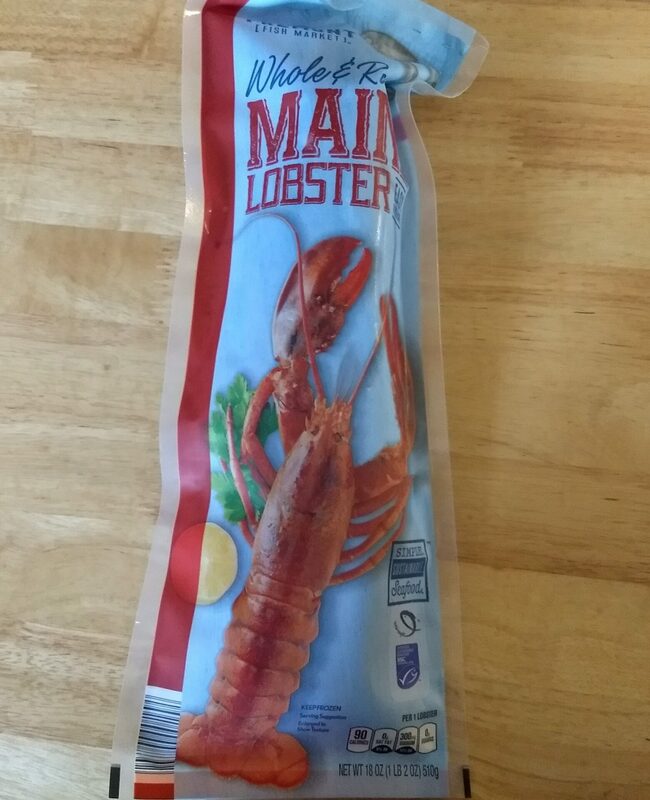 The packaging also puts the lobster’s weight at 18 ounces: 1 pound, 2 ounces. The package lists three cooking methods: boiling, grilling, or baked stuffed. Boiling involves cooking from frozen in at least a 1/2 gallon of salted freshwater in a large pot, bringing the water to a rolling boil before dropping the lobster in, bringing the water back to a boil, and cooking for 12-15 minutes. Grilling the lobster involves thawing the lobster in cold water immediately before cooking. From there, you’re instructed to cut the lobster in half lengthwise with a “big sharp knife” by laying the lobster with the tail flat out on the cutting board, plunging the point of the knife into the center of the lobster’s belly side, about 1.5″ back from the eyes, cutting first toward the head and then from the same point back all the way through the tail. Next, you clean out the body cavity, lightly coating the lobster halves with butter or olive oil, or marinating with your choices of sauce. You then grill over medium flame, shell side down, for 8-9 minutes, until the shell turns bright orange and the flesh is white and firm. Then you inject your favorite marinade or butter into the claws, or shuck the meat and lay it in the body cavity with marinade, being careful not to overcook. To bake, you thaw the lobster in cold water immediately before preparing. You then remove the claws and knuckles, and shuck the raw meat, scoring the shell with a sharp knife or cracker. Then you cut the legs off at the first joint with kitchen shears and use a rolling pin to roll the meat out. 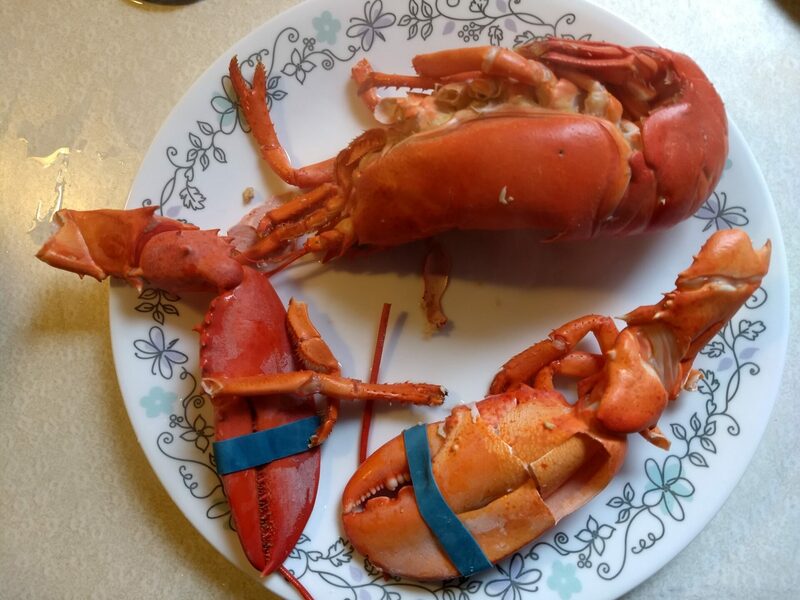 You then split the lobster in half using the same technique as the grilling instructions, following by mixing the claw, knuckle, and leg meat into “the stuffing of your choice”, then filling the cavity. From there, you bake at 400 degrees for 20 minutes, being careful not to overcook. In case it wasn’t obvious, boiling is the most straightforward of the three preparation methods. We boiled the lobster. The boiling instructions call for using at least a half gallon. We used a full gallon, although once it boils we found the lobster contracts enough that it fits in a Dutch oven or stock pot with little problem. It comes in a netting, which is really useful in keeping the lobster together while boiling. When we pulled the lobster out and removed it from the netting, we discovered it was separated out into pieces, which made it easier to dig into at the table. A whole lobster is a lot bigger than a tail, but there’s a reason why tails are popular: most of the meat is there. There is lobster meat in other parts of the crustacean, but most of it is small bit pieces in the legs and somewhat more in the lobster’s midsection as well as the claws. 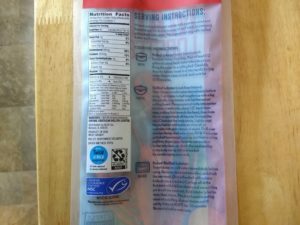 The package describes the lobster as a single serving because it’s just that: one serving of lobster. Still, as whole lobsters go, this is a pretty good one. We thought the meat was nice and tender — we liked it better than our experience with Specially Selected Wild Caught Maine Lobster Tails — and it went well with melted salted butter. We ate it alongside Aldi’s Specially Selected Crab Cakes and it made for a pleasant, if not terribly large lunch. We’ve come to expect, for the most part, that Aldi does premium foods well, and — once again — we weren’t disappointed. Fremont Fish Market’s whole lobster is easy to prepare and tastes good, and for a lot less than a whole lobster would cost at a restaurant. You’ll need some side items to pad the meal out, since a whole lobster isn’t as much meat as you would think, but as part of a meal this is a nice component. Raw lobsters are not red. Has this lobster been blanched? Comes out of the bag nearly black…but becomes bright red when it’s done steaming in the boiling water. Not blanched at all…must be flash frozen alive! 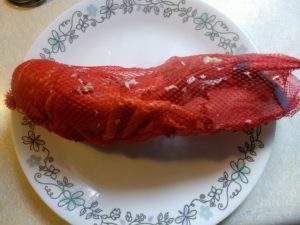 I had thought mine was red before cooking because of the red netting! Ours was also a dark color before it went in. (You can see it if you look carefully at our before picture above.) It came out red afterwards.